The tomato plants are weathering this cold snap pretty well. Don’t want to jinx anything yet, so I’ll just hum to myself and pretend I didn’t mention it. I sometimes think hot weather can be more destructive to tomato seedlings than cool. I guess it all depends on the specifics. So with cool temps, it’s the perfect time to do some sweaty work. One of my favorite things is picking up free wood chips from the local Department of Public Works. Today I got two trailer-loads, $150 worth when purchased from the local nursery by the cubic yard. Free, gratis, no charge, just drive in and they’re hauled to the trailer with a bucket loader. These are chippings that are collected by the streets department from fallen trees and trimmed branches. Granted there are occasional twigs and wrappers mixed in and the size isn’t quite as uniform as bagged, but it’d be crazy not to get them. Straw: Not at all my favorite mulch when used as-is from the bale. The stems are hollow and woody with less nutrient value than hay. Weeds poke through even the heavier applications of straw eventually (in my experience). It’s tough to nestle small seedlings into whole straw. But as with hay, shredded straw is a different matter, and it actually makes a pretty good vegetable garden mulch. Again, I don’t have free straw. I realize that many really good gardeners mulch with hay and straw. They’re just not for me unless I can find some freebies and do the shredding. 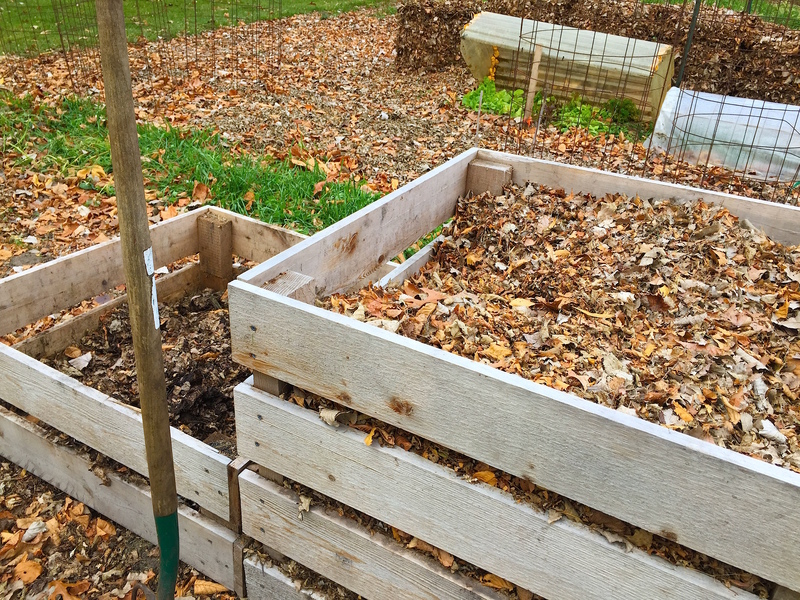 Wood chips: Some gardeners swear by wood chip mulch. Also not for me except in paths. 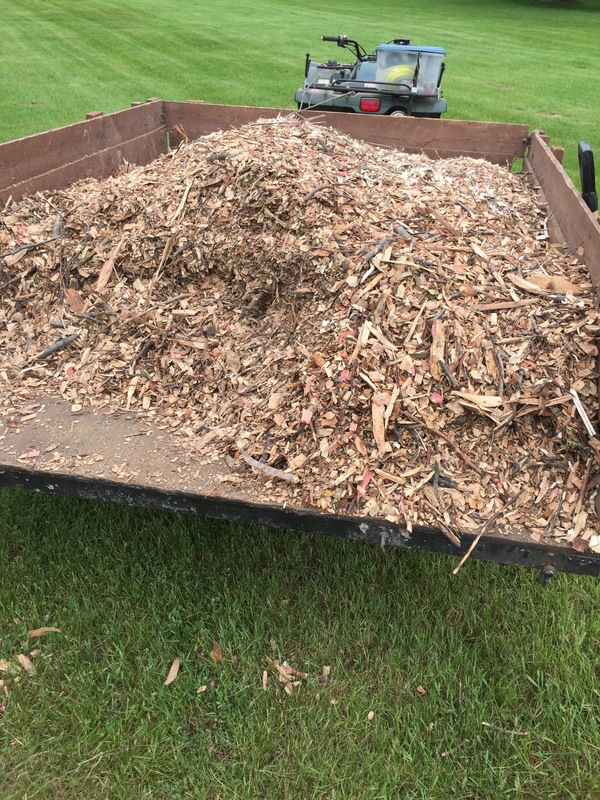 The stuff I get free from the county isn’t screened and there are just too many large pieces for anything other than paths (which I do cover with wood chips when I can). Even bagged chips seem iffy to me, because since my crops are rotated, there could be small seeds to plant in any given bed any given year. If the large chips have worked into the soil, that could pose a problem with germination of tiny seeds. Shredded bark is probably an excellent mulch, but way to expensive for my tastes. Leaves: Whole leaves aren’t a great mulch. They eventually sog down and mat together, not a good environment for most vegetables. But shredded leaves are a whole nuther matter. You’re probably noticing a pattern here. When in doubt, shred. It makes all the difference. More surface area, more air space, better water flow. Free. Grass clippings: Probably my favorite mulch. When applied correctly (maybe 4″ deep, depending on the plant size, dried for a bit in the sun) they’re awesome. Weeds won’t normally pop through a good mulch of grass clippings, and they return organic matter and nitrogen to the soil. My neighbor sometimes lets his field grass get pretty tall before mowing and lets me help myself to the clippings. They’re easy to pick up, but face the same drawback as hay; too much length to effectively keep weeds from popping through. Shred. The only problem that I’ve ever had with grass clippings applied correctly is getting enough of them. I’ll shamelessly stop the car at a neighbor’s curb and scarf up their brown Ace bags, but that can be a mixed lot. Sometimes even nauseating. My opinions only. Not scientific, not thorough. A permaculture system would negate most everything I just said. But no matter what the material, your garden needs mulch. For weeks, the trees shower down buckets and barrels and boatloads of nutrition for the garden. My fall leaf strategy is this: to avoid picking up a rake at all costs. It’s a miserable chore best left to wives and children. But when wives and children are involved with leaves there will be carnage and destruction. Instead, I sit on the riding mower listening to Steely Dan, blowing those suckers into a windrow where they’re re-chopped with mower blades until I’m satisfied. This serves two purposes; to reduce the volume of the leaves and to increase their surface area (which in turn discourages matting and promotes faster decay). Then out comes the pull-behind grass catcher, and viola. This season those wonderful concrete-reinforcing-wire tomato cages will work for me during the cold months. They make perfect storage containers for chopped leaves. Why should they lounge in the barn taking up space when they can store shredded leaves that’ll make awesome mulch in the early spring, when grass clippings are just a gleam in God’s eye? 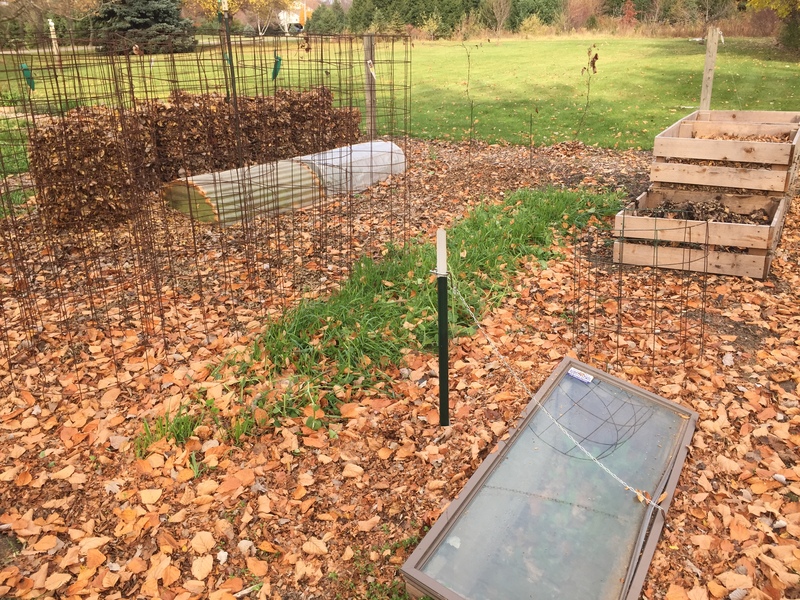 The leaf towers also serve as a windbreak for my cold frames. Plus they’re an attractive garden feature for the neighbors. Or maybe not. You’d think after 38 years worth of organic vegetable gardening, I’d be able to hang up my ‘Dr. Garden’ plaque and smile at the junior peach fuzz apprentice gardeners. When I semi-retired two years ago I realized that I had been doing a great job of recycling; recycling a lot of my own wrong-headed ideas and practices. And then I decided that I would start learning. From others, from my own mistakes and successes, from nature. The first thing that I learned, the thing that a wiser person would have caught on to decades earlier, was that soil comes first. You feed the soil, not the plant. Sounds so basic, but it was enlightenment. The second thing, a thing I sensed but hadn’t quantified, was that nature won’t tolerate a void. Soil left bare will fill itself with weeds or grass. If you don’t plant it or mulch it, nature has its own party in the breach. The challenge is to set one’s own party agenda.